So What The Heck Is T-X? From time to time, I’ve posted various items regarding the US Air Force’s T-X program. A Facebook friend contacted me with a very good question- what the heck is T-X? 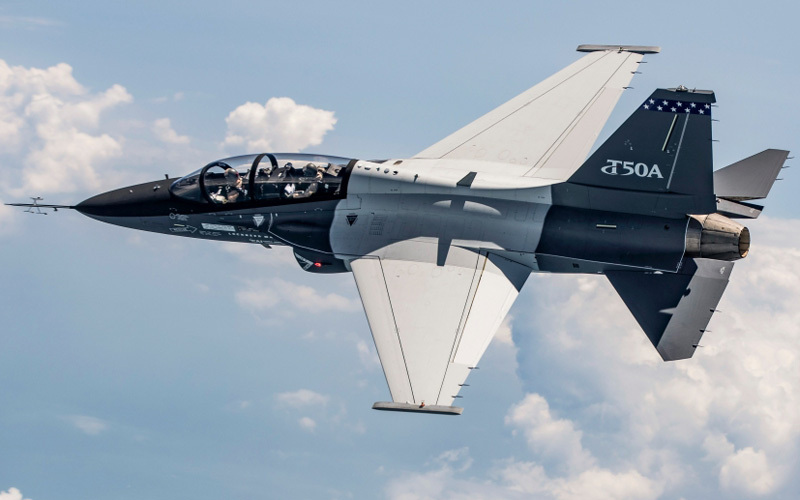 The ten second version is “T-X” is the shorthand way of referring to the US Air Force’s Advanced Pilot Training (APT) Family of Systems (FoS) program, which is an effort to replace the service’s aging T-38 jet trainer with a new and modern jet trainer. 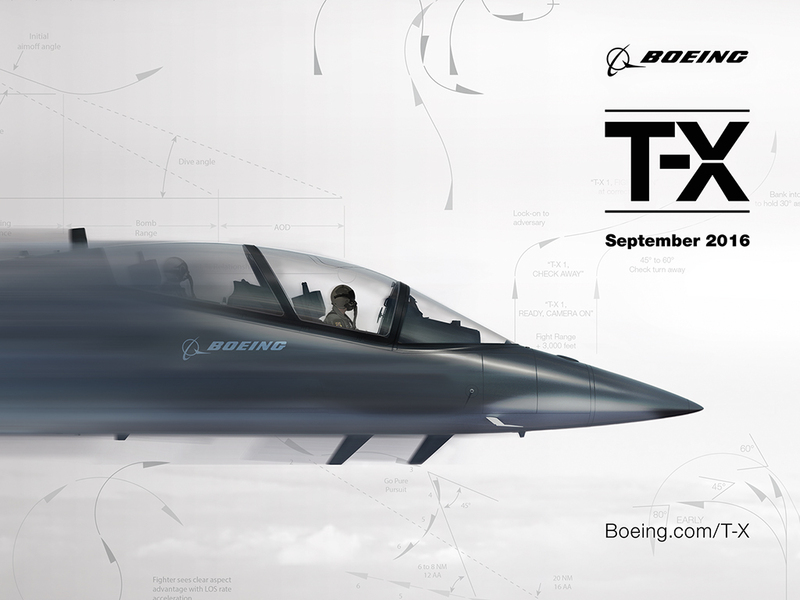 T-X essentially means “Trainer- Experimental”. Once a formal selection has been made, the aircraft will be given an official designation, much like “JSF” gave us the F-35, and the F-X program in the late 60’s gave us the F-15. The program involves more than just an airplane. It encompasses the airplane, its maintenance and upgrades, ground based training simulators, classroom material- pretty much the whole program. Basically it will be “we provide the stuff, you provide the people”. And it’s a long term program, designed to be the jet training platform for generations of pilots that will fly the 5th Generation F-22 and F-35 aircraft, as well as others in the USAF inventory- current and future. Whoever wins this contract could conceivably see their children retire from it. Obviously for the winner, this will mean a lot of money. I’ve read numbers indicating that the $10 Billion range is reasonable, though given how past projects tend to grow, I fully expect that number to rise. And of course all of that money means production, which means jobs. The Advanced Pilot Training (APT) Family of Systems (FoS) program has published various draft documents outlining the requirements for the aircraft in great detail. And it’s available to the public, though you may have to register to download it. The specification outlines everything from storage space in the cockpit for the pilot’s kit bag to the expectations of flight performance, and everything in between. And unlike many government projects which generally go to the lowest bidder that can demonstrate the ability to deliver, this one adds performance measures. There will be various items a manufacturer can get “points” for that will improve their chances of winning the contract. For example, the Air Force identified a particular flight maneuver that would be evaluated to test the sustained G-capability of the aircraft. The high G maneuver shall be flown with a Standard Configuration, at 80% fuel weight (relative to maximum fuel capacity) and Standard Day conditions. The maneuver shall begin in level flight (flight path angle no lower than zero and no higher than two degrees nose high), wings level (±5 degrees of bank), at 15,000 feet PA, and at or below 0.9Mach. From this point, the aircrew will immediately initiate bank and back pressure to achieve the highest maintainable G­loading. The G­loading shall be maintained for a minimum of 140 continuous degrees. The aircrew may begin reducing the load factor and rolling out after a minimum of 140 degrees in order to roll out at approximately 180 degrees of turn. The flight path angle shall be no lower than 15 degrees nose low and the aircraft shall descend to no lower than 13,000 feet PA during any portion of the entire 180­degree maneuver. There is no power setting specified for this maneuver. The aircraft shall lose no more than 10% of the initial airspeed during the 180­degree maneuver. There are no specified degrees of turn for roll in or roll out. “Approximately 180 degrees of turn” is meant to describe a recognizable maneuver without mandating exactly 180 degrees. There is no specified length of time for the 140­degree portion of the maneuver or for the 180­degree maneuver as a whole. Minimum acceptable load factor will be 6.5 sustained for a minimum of 140 degrees. The lowest load factor registered during the 140­degree period will establish G­loading for the maneuver. For example, if the aircraft maintains 7.2Gs for less than 140 degrees and then drops to 6.9Gs by the end of the 140­degree period, 6.9Gs will be used as the maximum G­loading. There is no requirement to exceed 7.5Gs. There are four primary contractors expected to participate. Each comes with with various partners to help improve their chances of winning the contract. Where relevant, I’ve indicated the designation of the aircraft for particular teams. While Boeing itself may not be a household name in fighter/trainer aircraft, Saab certainly is. They’ve been producing aircraft for Sweden and export for years. Their current fighter, the Gripen, is a respectable fourth generation fighter that is well regarded. And while Boeing may not have a rich fighter/trainer history, it purchased McDonnell Douglas, which absolutely does, so it has assets and expertise that can’t be overlooked. Additionally, Boeing was a partner with Lockheed Martin for the F-22. As of this writing, their design has yet to be fully revealed. Lockheed-Martin comes into this program in a good position. In conjunction with Korea Aerospace Industries, they’ve already produced a very good competitor, the T-50A. Initially developed as a trainer/light strike fighter for the Korean Air Force, the T-50 has been in service for a few years, and has also been exported in trainer, strike/trainer and fighter/attack variants. It’s a supersonic capable, fly-by-wire aircraft that is already in full production. LM went into the project with KAI knowing that a T-X program was coming some day, so they’re ready for it. They’ve already dedicated space in South Carolina for final assembly. And LM built the F-22, and is building the F-35, so this is not their first rodeo. Northrop Grumman is certainly not a greenhorn in fighter or trainer development. The current USAF jet trainer, the T-38, started life as a Northrop product. The name Grumman had been synonymous with Navy fighter for decades. And teaming with BAE Systems, producer of the Hawk family of trainers, is a very smart move. 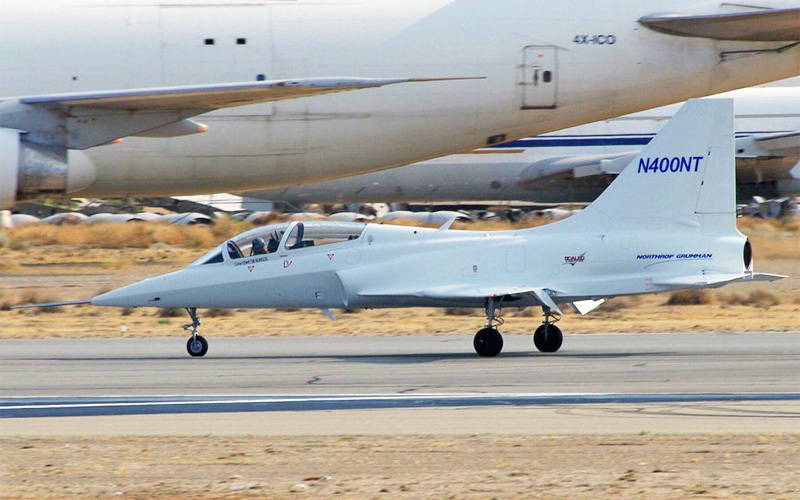 The US Navy uses the T-45 as their jet trainer, which is a BAE Hawk derivative. Ironically, BAE Systems teamed with McDonnell Douglas, now part of Boeing, for that project. Originally a version of the Hawk was going to be used as the basis for the NG/B entry, but after the Air Force released the initial expectations for the T-X, a decision was made to go to a “clean sheet” design. Their new design has just been spotted in the last few weeks, currently designated the Model 400. 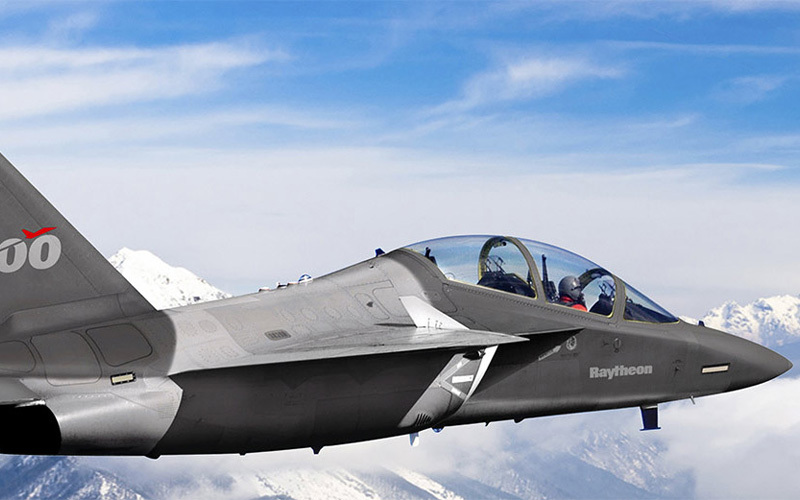 While Raytheon is not a household name in aircraft history, they’ve certainly made their mark in the defense industry, producing a wide variety of communications, training and armament products for decades. And Leonardo, formerly known as Alenia Aermacchi, has been producing the M-346 jet trainer for a few years now. It’s a well respected, widely used jet trainer that originally started as a joint project with Yakovlev. (Though they later split up, with Yak independently developing the Yak-130 trainer.) A version of the M-346, the T-100, is their entry for the competition. Israel recently selected the M-346 as their new primary trainer. Given that they will be a user of the F-35, this certainly can be seen as a positive development for their T-X entry. I believe Lockheed Martin comes into this in the drivers seat. They have an aircraft that looks to be able to fully meet the requirement, and is well beyond the need for years of prototyping and development. While it’s certainly no slam dunk on their part, in many ways it is their’s to lose. Raytheon does bring some great strength with its training pedigree. Because of the growing cost of maintaining and flying aircraft, ground based simulators and other training are a critical part of the program. Offering cost savings and capabilitiy there will be a plus on their score card. While the Raytheon/Leonardo T-100 is a proven platform, several sources I’ve read indicate that it is just within the performance envelope the program requires. Of all the designs in play, it is the oldest, and is arguably at the end-point of its upgrade ability. Clearly the Lockheed Martin/KAI and Raytheon/Leonardo efforts are several steps ahead, with their aircraft being in production. Yet that could also be a hindrance if the program adds new requirements, or the two clean sheet designs bring in performance capabilities that were not expected. Another wildcard is the US Navy/Marines. While the T-45 aircraft is expected to be their trainer well into the 2030s, it can’t be overlooked that T-X is basically the trainer future F-35 pilots will learn on for the Air Force, so its systems will be focused on that. It would not surprise me at all if the Navy began to look towards the T-X winner sooner than later. Given the rising costs of flying and maintaining aircraft such as the F-22, F-35 and other “legacy” fighters, it would not be surprising if additional aircraft from the T-X program were purchased simply to give flight time to aircrews to perform additional training. While flying in the real aircraft can’t be substituted, a networked fighter with a glass cockpit can do simulations to the point that aside from the flight characteristics of the airframe itself, the tactics and methods can be virtually duplicated. This could result in per-hour savings aross the board at the operational and training level. The T-50 and M-346(T-100) are already being exported in several variants, and a win by one of those aircraft would certainly not hurt future prospects in that regard. (Unless DoD gets overprotective.) A win by one of the other teams could be equally beneficial in the export market, both as a trainer and light strike fighter platform. The final RFP for T-X is due out by December 2016. While it’s not expected to change drastically, it will be interesting to take a look at the final format. Unlike the F-22 and F-35 programs, this one should move along a little faster- at least that is the USAF’s intent. And because this one does not have near the secrecy of those two previous programs, we should be able to track developments with some detail. If nothing else, I’m looking forward to building a model of the winner one day!